A University of Hawai‘i project to promote and expand breadfruit use in the Pacific has won a top award from the University Economic Development Association (UEDA). 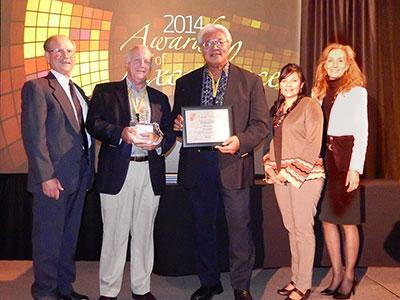 Recently the Pacific Regional Breadfruit Initiative, a project of UH’s Pacific Business Center Program (PBCP), won UEDA’s award for Research and Analysis in Santa Fe, New Mexico. Receiving the UEDA Award of Excellence was the PBCPʻs Senior Business Development Manager C. L. Cheshire, and Director Failautusi Avegalio. Avegalio attributes the Pacific Regional Breadfruit Initiative’s success to the groundbreaking research and analysis led by the National Tropical Botanical Garden (NTBG) Breadfruit Institute and its Director, Professor Diane Ragone. That research affirmed the many uses of the breadfruit tree and fruit or ‘ulu in Hawaiian. According to Avegalio, breadfruit is gluten free and the U.S. market demand for gluten free products is projected to hit $15.5 billion in 2016. Major byproducts of breadfruit include the breadfruit sap that is 100 percent organic latex, and the breadfruit flower, which contains several powerful chemical compounds more potent than those used in the leading synthetic insect repellent on the market. The tree’s wood is resistant to marine worms and termites. The breadfruit tree also has a high salinity tolerance, enabling it to survive inundation from rising tides where traditional food crops such as taro, banana, tapioca, and yams cannot. The Pacific Regional Breadfruit Initiative team includes the NTBG Breadfruit Institute, the University of Hawai‘i at Mānoa’s College of Tropical Agriculture and Human Resources (CTAHR) and Shidler College of Business; Kansas State University College of Agriculture; University of British Columbia, Okanaga, Fipke Centre for Innovative Research; Scientific Research Organization of Samoa (SROS); Robinson Fresh/C.H. Robinson, California; Natural Foods International, Samoa; Intertribal Council On Utility Policy (COUP) Rosebud, South Dakota; Olohana Foundation, Hawai‘i; Agroforestry Net, Inc. Hawai‘i; and the American Samoa Department of Commerce. The network spans millions of square miles from Washington D.C. to the Commonwealth of the Northern Marianas in the Northwest Pacific, to the Federated States of Micronesia, in the Central Pacific, and to the Samoas and Fiji Islands in the South Pacific. Collaborators include U.S. and Pacific land-grant community colleges, regional universities, research institutions, health and nutrition organizations, medical technology, non-profit, community, faith based, native Hawaiian and indigenous organizations, and local and federal government agencies. The PBCP envisions Hawai‘i as the major processing, refinement, and export hub to the U.S. market for sustainable and gluten-free food products, such as flour made from breadfruit. The Commonwealth of the Northern Marianas Islands (CNMI) would serve a similar function for the Asian market. Support from the Ulu Pono Initiative of Hawai‘i helped to launch the Pacific Regional Breadfruit Initiative’s inaugural Breadfruit Summit in 2012, which was hosted in Pago Pago by former Governor Togiola of American Samoa. American and Western Samoa are leading the initiative in Polynesia. In 2013 the Micronesian Chief Executives Summit endorsed the Breadfruit Initiative for Micronesia under the leadership of Governor Inos of the Commonwealth of the Northern Marianas Islands in Saipan. Fiji-based agriculture consulting firm Koko Siga Pacific, the University of the South Pacific, and the U.S. Embassy in Fiji are collaborating on a Melanesian Breadfruit Summit in early 2015. A Pacific Regional Breadfruit Conference is being planned for October 2015 in Hawai‘i. Avegalio serves in two management roles for the University of Hawai‘i. He serves as the Director of the PBCP and as the Executive Director of the Honolulu Minority Business Enterprise Center (HMBEC), both housed at UH Mānoaʻs Shidler College of Business. The UEDA Award marks the second national honor for programs under his management within months of each other. In August, the HMBEC was inducted into the Minority Business Development Agency Century Club and further recognized as a National Top Performing Center by the U.S. Department of Commerce. Avegalio credits this national recognition to the outstanding leadership of HMBEC Director Dana Hauanio. The Pacific Business Center Program was established in 1979 to provide governments, companies, and institutions in Hawai‘i with business-related services such as financial analysis, management reviews, business plans, and other business technical support. Since its inception, PBCP has expanded its span of services to include other Pacific Basin islands, including the territories of American Samoa and Guam, the Commonwealth of the Northern Mariana Islands, the Federated States of Micronesia, and the Republics of Palau and the Marshall Islands. Current funders of the PBCP include the U.S. Department of Commerce‘s Economic Development Administration and the U.S. Department of Interior‘s Office of Insular Affairs with matching support by the University of Hawai‘i.